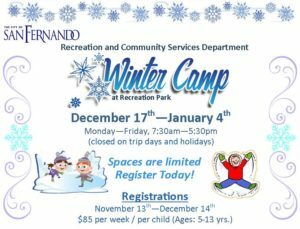 The City of San Fernando offers Day Camp Programs designed to enhance children’s social and recreational abilities and improve their quality of life through educational and enrichment activities. It is our goal to provide children with a safe, fun, and life-lasting experience. Please Note: Only legal guardians will be authorized to register participants.